OK, we're getting down to the last few Final Fantasy 5 job classes here, but there's still plenty of entertaining ones left to do! 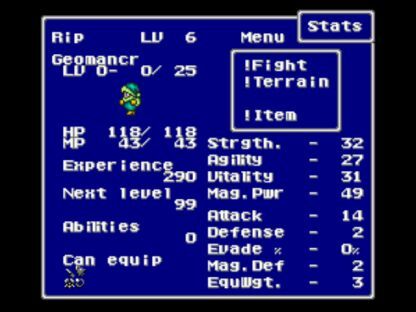 For this game, I will be looking at the Geomancer job, one of the true oddballs which has appeared only rarely in other Final Fantasy settings. 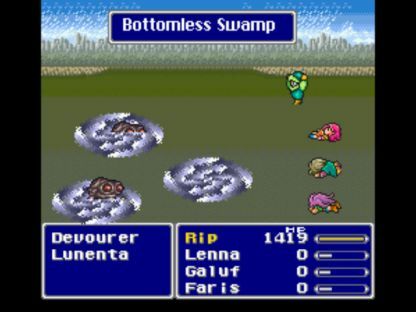 The Geomancer attacks by using an ability called "Terrain", in which he or she manipulates the surrounding natural environment to damage opponents. If you happen to be at sea, you can expect to get water-based attacks; in a cave, earth-based damage, and so on. Where the battle happens to be fought is the biggest determining factor for what moves Terrain will spawn. The Gameboy Advance remake translates this ability as "Gaia", which is a more poetic rendition of the original Japanese. ("Chikei", which is ちけい in hiragana, and more properly 地形 in kanji. Yes, I did have to look up the kanji in a dictionary! My knowledge of Japanese is pretty limited.) This literally means "Terrain" in Japanese, so score one for the literal fan translation. In other words, as the Geomancer's level goes up, the number of different possible terrain attacks increases as well. (In particular, for a solo run like this, I expected to be getting "Spell 3" an awful lot; at Level 50, it would come up 3x more often than the others!) You might think that the higher numbered spells are better, but that's not necessarily the case either; a number of the "Spell 4" moves are instant death spells that turn out to be useless against bosses. Heh. To make things more confusing, the same Terrain attacks can be listed as "Spell 3" on one type of setting, and the same Terrain attack will be "Spell 2" or "Spell 4" elsewhere! There are 24 different Terrain attacks in all, which I'll cover one at a time as they come up in the gameplay. Too much to try and run through them all right now! Most of the Geomancer's stats are pretty average across the board, although for what's primarily a backrow magely class both the Strength and Vitality are rather decent. The true advantage of this class lies in the Magic Power stat, however, which starts just below the 50 point mark. Most of the Terrain damage formulas are derived from the standard magic damage formula, which is based off of Magic Power and character Level. Thus, increasing Rip's Magic Power (and his level) would be the best ways to increase damage. Certainly better than trying to attack with the character-specific bell weapons! Seriously now, bells?! Rip will stick with knives for physical attacks, thank you very much! Gust is the weakest and most basic of the Terrain spells that a Geomancer can use. It does Air-element damage to a single target (which you don't get to pick) at a strength halfway between Aero and Aero 2. Since Rip had such a low level, he didn't qualify for anything but the "Spell 1" category, and thus kept using Gust on every single encounter inside the Wind Shrine. That was plenty to kill everything in one hit... except the Mold Wind enemies, who absorbed Air element and had to be defeated with some dagger action. This was already proving to be an interesting character, and I wasn't even out of the Wind Shrine yet! Tsunami was the same strength as Gust (spell attack 38; compare to Fire's 15 and Fire 2's 50), but had the advantage of hitting all targets at once instead of a single enemy. 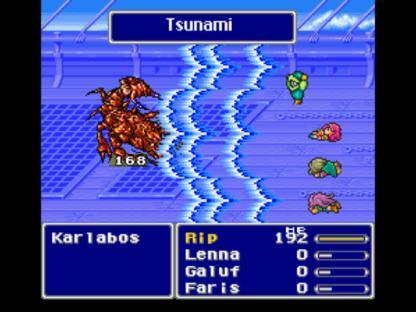 While you'd expect that Tsunami would do water-based damage, it's actually a non-elemental spell, in another one of Final Fantasy 5's buggy little quirks. At ~160 damage per use, Rip had to get in 5 attacks against Karlabos, which he managed with a minimum of fuss. Once "Whirlpool" appeared instead of Tsunami, a weak attack that reduces hit points to critical, which unfortunately missed because of Karlabos' boss immunity. Rip would start seeing a larger variety of moves as his level began to increase, and he rose up out of the "Spell 1" range on the Terrain magic chart. The Ship Graveyard was a mixture of more Tsunamis on the outer decks of the ships (usually killing all monsters in one hit), and a new Terrain attack called "Will-o-Wisp" in the interior areas. This was a fire-based elemental attack which did highly variable damage, with a base damage of anywhere from 1 to 100! I generally dislike those attacks, since they're so unreliable in dealing steady damage. Good enough for the undead foes in the Ship Graveyard though. Siren was prey for more Will-o-Wisp terrain attacks, especially in her undead form which is weak to fire. At the end of the battle, Rip pulled out a new terrain move called "Stalactite", which did 600 damage to the old girl - wow! That's one of the better Terrain results that the Geomancer can get, and I would see more of it later on when venturing through cave areas. In the outdoor areas, Rip found his Terrain attack producing a mixture of Gust and Earthquake, the latter a new earth-based magical attack that did heavy damage to all ground targets. 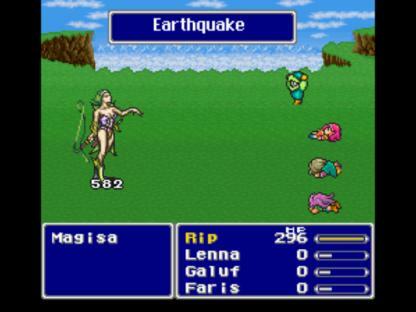 For this early in the game, Earthquake usually killed everything instantly, and it was a welcome surprise when it showed up. When Rip ventured through forests, his Terrain attacks switched over to a mixture of Branch Arrow and Leaf Dance; the former did good damage to a single target, while the latter did weakish damage to all enemies. I found the forest Terrain moves to be generally some of the weakest ones in the whole Geomancer set, and was glad that Rip rarely had to face anything too dangerous in these areas. One Gust, one Earthquake, and she was dead. Forza never had the chance to show up. Rip really liked this Earthquake move, the only real downside was that it didn't hit flying enemies, just like the Titan summon spell. This would unfortunately cause some difficulties a little bit later on. As the name and graphics indicate, this was an air-element magical attack that hit all opponents for good damage. Gale Cut is listed in the code with a spell attack of 90, quite a bit stronger than Fire 2 (50) but still well short of Fire 3 (185). Right now, it could kill every random encounter in one go, and was a great spell to pull for free out of the Terrain ability. 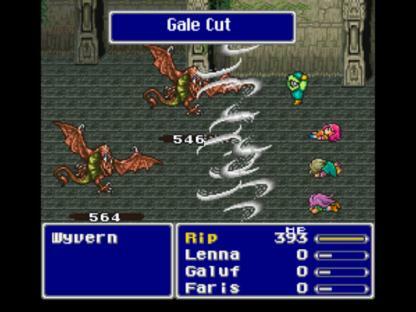 Galura died to three Gale Cuts with no danger. Rip upgraded to slightly stronger armor in Karnak, and picked up the Mythril Dagger for another offensive weapon aside from that silly bell. The monsters on the plains outdoors were generally pretty easy to defeat, although the Zuu bird creatures couldn't be hit by Earthquake and were only vulnerable to Gust, which slowed things down a bit. Unfortunately, the inside of the Steamship had the same combination of Terrain attacks (someone explain that to me! ), and all of the random encounters in this area have flying status, making Earthquake completely useless! Rip had the choice of moving into the front row and relying on physical attack with the Mythril Dagger (not a great option), or sticking in the back row and hoping for lots of Gust attacks to appear out of Terrain. I went with the latter choice, which was slow and tedious but eventually got the job done. This was not a particularly fun area for Rip. Even worse, it turns out that Liquid Flame absorbs air element damage! This meant that Rip could not use his Terrain ability against her, as Gust would heal the boss whenever it appeared. I had to fall back on physical attack, which did work OK, but forced the drinking of lots of Potions and several Elixirs as well. I longed for access to some kind of healing ability, as several of my previous solo characters have had, but it was not an option for Rip. 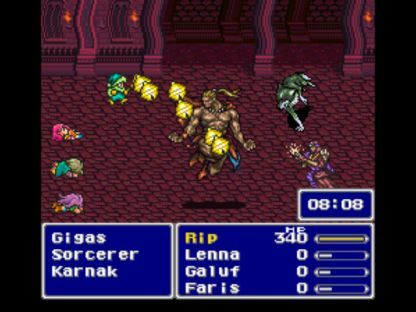 Then during the escape sequence from Karnak Castle, Rip found that the two key treasures he needed to pick up (Elf Cape and Guardian dagger) were guarded by Gigas enemies, who use nothing but Aero spells and are immune to air element. And to my surprise, I found that the Terrain attacks in Karnak Castle had changed again, to ones that were entirely air-based, nothing but Gust and Gale Cut. Errr, how exactly to take down those Gigas foes, who were immune to every Terrain attack? 1) If Void has been cast, then no attack occurs; do not follow any more steps. 3) Apply Target Status Effect modifiers to Defense and M (magical) (6.5.10). 4) Damage = (Attack - Defense) * M. Max Damage = 9999. This has got to be one of the strangest weapons in the whole game. Despite being a physical weapon, bells do full damage from the back row and use the Magic Power stat instead of Strength for calculating the multiplier M. They also have a really funky way of calculating the base damage, averaging together Attack/2 with a random number between 0 and Attack/2. For Giyaman's Bell, that meant that the attack was anywhere between 12 and 24 on each strike. Very weird stuff. Anyway, in this particular situation it did a little over 200 damage per attack, enough to kill Gigases in 3 hits, and once Rip had the Guardian dagger I could swap over to a more normal weapon. 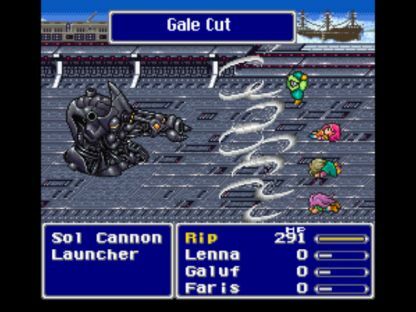 Iron Claw at the end died to a single Gale Cut, which was now doing 700+ damage as Rip's level increased. I figured that Rip would need a few more levels before he could take on the bosses in the Ancient Library, however this seemed like an opportune moment to go ahead and scout the Ancient Library, seeing what Terrain attacks Rip would produce inside the new environment. I quickly found that Terrain resulted into Will-o-Wisp, and nothing but Will-o-Wisp. Now with this being a fire-based attack, it was very strong against the book random encounters - and completely useless against Ifrit! Yeah, using fire against the hellspawn flame summon demon probably wasn't going to work that well. This meant that Rip would have to defeat Ifrit with his melee attack alone (good thing he picked up the Guardian a little earlier, eh?) First I needed a few more levels for additional max hit points and increased damage; I saw that Rip would get an extra attack multiplier at Level 28, and gained six extra levels to reach that target. Now doing about 250 damage per attack, Rip was able to slug his way past Ifrit at the cost of three Elixirs used. Would have liked to have done that in more elegant fashion, but Rip couldn't do much else. 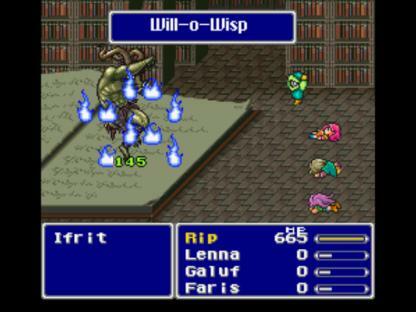 Of course, as bad as Will-o-Wisp may have been against Ifrit, it was good against Byblos and his weakness to fire damage. Rip took down the boss in short order, and won on my first attempt with only a single Elixir used. All told, this was a pretty good outcome for my solo Geomancer. I'd much rather have a tough battle against Irfit and an easy one against Byblos than vice versa. After getting the ship and running around to Jachol, Istory, and Crescent, Rip ended up right back where he started at the Ancient Library. I tested out his Terrain attacks in the upcoming desert environment, and found three possible options: Dust Storm (earth and air damage to all enemies), Desert Storm (an upgraded version of the same), and Quicksand (an instant death spell). 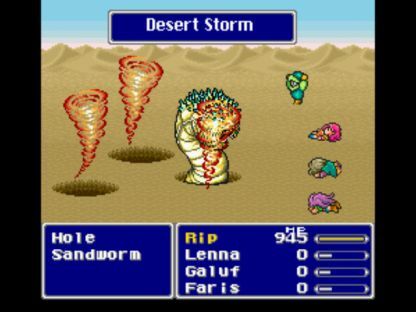 Unfortunately Quicksand wouldn't work against a boss like the Sandworm, while Dust/Desert Storm hit all targets - not good in this boss fight! Whenever you hit one of the "Holes" instead of the Sandworm itself, the boss responds by casting Demi, cutting your current health in half. Because Rip couldn't control his Terrain attacks and what they hit, he was forced back on melee attack with the Guardian dagger once again (despite the cool graphics of the Desert Storm spell!) Two Elixirs and a lot of stabbity death got Rip past the Sandworm. The Terrain attacks in the desert worked quite well against random enounters, Dust Storm killing entire mobs in one go while Quicksand sucked individual monsters down to a sandy tomb. This area was even easier than normal, and it's never particularly difficult. Despite facing Crayclaw on a flying airship, the Terrain attacks for the boss fight turned out to be the same water-based ones that Rip had seen against Karlabos: Tsunami, Whirlpool (useless against a boss), and Big Tsunami. I made no attempt to use healing items, and simply spammed Terrain moves in the hopes of getting several Big Tsunamis in a row. This worked after about a dozen tries, with Rip blocking the melee attacks of Crayclaw with his Guardian/Elf Cape combo. Adamantium's high physical defense and Armor status make him all but impervious to melee attacks; fortunately, Rip was able to bypass these with Terrain moves that did magical damage. This boss fight used the "Caves" Terrain set, so more Will-o-Wisp and Stalactite attacks, the latter of which did really strong damage when it appeared. Rip was able to slug his way through this battle and take down Adamantium faster than he could be killed himself. The Terrain ability is rarely strong enough to do that, but it sufficed here. Gale Cut was totally useless, no damage printout even appearing after it was employed. This of course meant that Rip was going to have to kill both Launchers and the Cannon itself with dagger attack, with no abilities whatsoever and no means of healing himself other than Elixirs. Urp. Better get to work raising levels and grinding out more Elixirs in random drops! To make a long story short, Rip was finally able to defeat Sol Cannon after reaching Level 36 (where he gained an extra attack multiplier). But the victory was costly, oh so costly: I needed to drink NINETEEN Elixirs!!! Dear Lord. I hoped that there wouldn't be any more boss encounters like that, however I had a sinking suspicion that there would indeed be cases like this again. That picture shows the damage from the first Gale Cut, the other forms taking considerably less damage. The following meteor miniboss trio wasn't too bad, with the Chimera Brain and Titan getting the strong "Caves" Terrain attack group. They went down with little fuss. The dreaded Puroboros were fought instead in the forest, where Rip was able to use Leaf Dance (a move that hits all enemies) and weaken them all into the critical range, where they Exploded rather harmlessly. 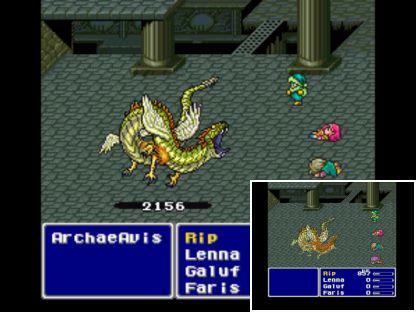 This was one boss battle where the Geomancer class had a ready solution. The fights on the Big Bridge in the second world were actually pretty tough! Rip drew a Terrain moveset of Gust/Gale Cut/Sonic Boom here, and anything other than Gale Cut was mostly ineffective. With Rip still not having Hi Potions in his inventory yet for healing, it was pretty dicey trying to kill the random enemies before his health was drained out. 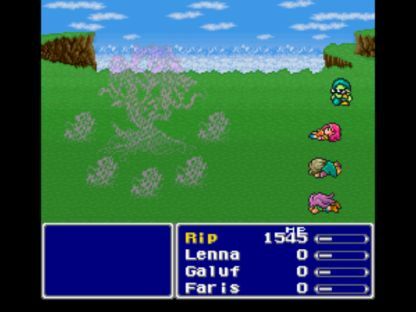 Gilgamesh was rather straightforward to defeat with Elixir help, but only because Rip had the good fortune to successfully Mute him with the Mage Masher dagger (at 1/3 odds) right before Gilgamesh cast his triple buffing spells of Haste/Armor/Shell. With all of those spells blocked, it wasn't too hard to win. Bottomless Swamp instantly kills all enemies that don't have the "Heavy" flag in the code, in a fashion similar to the Samurai' Slash move. Even better, the animation shows them getting sucked down into the ground to their demise. Although this attack might be totally useless in any kind of boss encounter, it's definitely one of my favorites in the whole Terrain set! 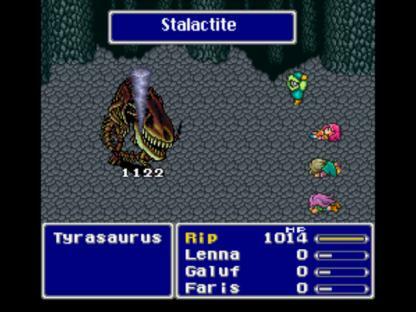 This is another fun attack to use, as a stalactite drops off the ceiling and falls onto the monster in question, doing very substantial damage. It was defintitely more entertaining to use the Terrain attacks here than go with your standard Phoenix Down for the instant kill cheese! That brought Rip to the Hiryuu Valley, where he would end up spending an unexpectedly long time. The first problem in this area was his inability to equip the Bone Mail; the Geomancer is one of the six classes in the game which cannot use the armor. Quite aside from taking more damage in random encounters, this meant that Rip would not be protected against a number of status ailments in his battle against the Hiryuu Plant. Remember that the five Flowers inflict five different status ailments: Aging/Old, Darkness, Poison, Paralyzation, and Confusion. The Bone Mail alone will protect against everything but Paralyzation! Denied that resource, Rip was forced to equip an Angel Ring (protecting against Aging status at least), and Darkness/Poison statuses were pretty irrelevant, but that left him struggling to contend with Paralyzation and Confusion. Hmmm. 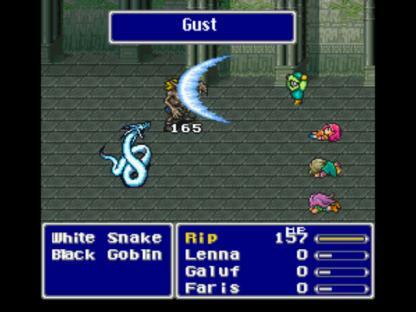 Because Rip was Level 40 at the time, he had roughly 1/4 odds to get Gust, 1/4 odds to get Earthquake, and 1/2 odds to get Cave In. Appearances of Gust were completely useless, and to be avoided at all costs. I liked it when Cave In would appear and kill Flowers #4 and #5, the ones that inflicted Paralyzation and Confusion status. When this did not happen, Rip tended to get stuck in endless cycles of confusion and paralyzation, unable to issue a single command as he was slowly plinked to death by the flowers. 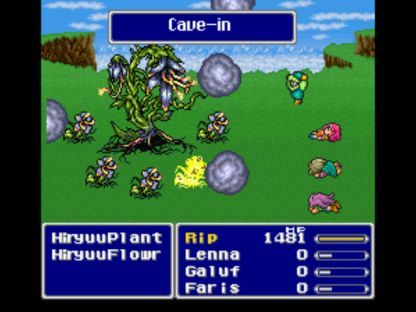 You might say, why not manually attack those Flowers and then go with Terrain attacks, but keep in mind that one of the other Flowers inflicts Darkness status, so that option was out. It really was a total crapshoot, just rolling the dice with Terrain and hoping that Cave In or Earthquake would appear and take out the correct flowers. Cave In actually did do very strong damage, sometimes as much as 4000 per total attack, it just couldn't be controlled or targeted in any way. Caught them fading into the purple mist, and good riddance! Now I could move on to the next part of the game. One appearance of Whirlpool, one strike from the dagger, and he was done. 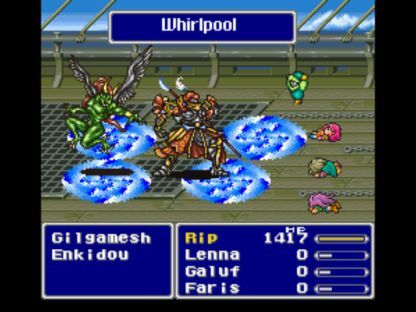 Unfortunately Gilgamesh was not weak against the same attack, so any other appearance of Whirlpool was completely wasted. This would have been an easy battle, except for the dreaded Death Claw spell which meant instant defeat if Gilgamesh cast it successfully. HP to critical along with paralyzation status might as well be a giant "screw you!" to any solo character. If only there were some more items in this game that blocked paralyzation, sigh. Anyway, this was another boss battle of pure chance, only this time needing to dodge an enemy spell. Rip's Terrain moves actually worked pretty well here, they just needed enough time to wear down the bosses without getting annihilated by Death Claw. Eventually it worked out, with enough repetitions.